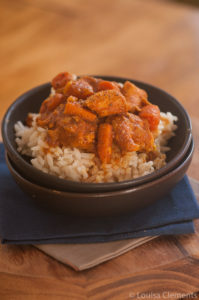 Make slow cooker moroccan chicken stew for dinner with this easy recipe with chicken breasts, sweet potatoes and carrots cooked all in the crockpot. My slow cooker was a lifesaver last weekend as it has been for many recent weekends. Between film shoots, chicken wings and beers, blogger outings, brunches and homework there wasn’t much time to spend over a hot stove and when I say there wasn’t much time I mean there wasn’t any time. Mind you, somehow I did manage to get in some chocolate chip cookie baking, and was able to perfect another slow cooker recipe coming your way soon. Now that I think about it, I’m not really sure how I packed that much into one weekend. But it happened, and it was great. Every now and then there is just a great weekend, one for the record books and this past weekend was one of those. It had a little bit of everything that I love and I woke up on Monday feeling not only a little bit tired but also fulfilled and happy. I’ve been posting lots of behind the scenes snaps over on Instagram so be sure to follow me there. Ever since I made Moroccan Chicken Soup last year, I’ve fallen in love with Moroccan flavours. I love the depth and how the combination of spices are so different from the kinds recipes I typically create. Moroccan cuisine uses a combination of sweet and savoury flavours, you’ll often find a combination of ginger, cinnamon, turmeric and allspice and they’ll often mix in dried fruit as well. This creates a complex flavour profile that is becoming increasingly popular in Toronto. I’ve been seeing Moroccan-style dishes all over menus, which makes me so happy, so expect more Moroccan-inspired dishes on Living Lou in the coming months. If you’re wondering what to pair with this slow cooker recipe, I’d serve it with my Moroccan inspired couscous salad for a well-rounded and simple meal. If you’re looking for something with a little bit of an ethnic flair, I highly recommend trying this slow cooker Moroccan chicken stew recipe. You might be surprised by the sheer amount of spices used, but when you finally get a chance to taste this stew, you’ll understand. This recipe requires about 10 minutes of cooking on the stove before dumping into the slow cooker, but it’s well worth it. Slow Cooker Moroccan Chicken Stew is a flavourful stew that cooks all day in your slow cooker. In a small bowl, combine cumin, paprika, turmeric, ginger, cinnamon, black pepper and salt. In a medium bowl, toss chicken with 1 tbsp of spice mixture. Heat olive oil in a large pan over medium-high heat. Add onion, sauté until beginning to soften about 2-3 minutes. Add chicken to pan and brown, 4-5 minutes. Add garlic, sweet potato, carrots and remaining spice mixture. Cook for 2 minutes. Dump chicken and vegetables into slow cooker. Add crushed tomato and water to the pan you cooked the vegetables and chicken in. Stir to loosen up brown bits on bottom of the pan. Dump liquid into slow cooker. Let me know if you give this slow cooker Moroccan chicken stew a try! Thank you! Yes, you must pull it out right now!! I think my slow cooker is the best thing that's ever happened to my kitchen! This looks so yummy! I need to try this! Lou! This looks great! It was so cold out today...I wish I had come home to this in my slowcooker! Thanks, Robyn! I know it was freezing today, meals like this are great for this kind of weather (which seems to have hit so suddenly!). Thanks, Consuelo! Let me know if you give this recipe a try. Louisa! I have no idea why it's been so long since I stopped by, but I'm happy I did so I could see this! This is sooooo my style. I need to make it! Hi Davida! Thank you so much - it's super flavourful and easy. Let me know if you try it! I keep seeing so many recipes that make me know I NEEEED to buy a slow cooker. This looks SO good! Yes, Amy! You NEED a slow cooker!! It will change your life. I found your recipe on Pinterest and made it today. So delicious! The spices were perfect and went so well with the sweet potatoes. I must admit I was skeptical of the crushed tomatoes, but they added a wonderful flavor. Definitely will make this again. Hi Katie, I'm so glad that you enjoyed it, thank you for letting me know! The crushed tomatoes add a nice subtle flavour and also are great for thickening up the stew. YUM! I made this and posted it on to Dinner Happy and it turned out great! I cooked mine for 4 hours, but I love the way it smelled! Thanks for sharing. I'm so glad that you enjoyed it - thank you for letting me know! It does have a really delicious scent when cooking. Do you think this would work with boneless chicken thighs? Hi Katia, yes boneless chicken thighs will be great! Let me know how it goes. Since finding this over a year ago, this is my go to slow cooker recipe for Moroccan chicken stew (always with thighs). Browning the chicken is definitely important and makes the dish so great. I sneak prunes or dried apricots in sometimes too! Thanks Lou! The ginger in this recipe, powdered of fresh minced? I am going to give this a go soon. Wow! You have surely allured many taste buds with this awesome recipe. Thank you for sharing this lovely recipe which looks like a must try for foodies. Moroccan delicacies are certainly delectable and this slow cooker Moroccan chicken stew looks simply incredible. Thank you for the kind comment, Klenin! I hope you enjoyed the recipe. Hey Lou, It looks so amazingly delicious. I will have to give it a try ASAP. Thanks for sharing. Now I will also share it to my Facebook Page of Single moms. Thanks Jessica, I appreciate your support!